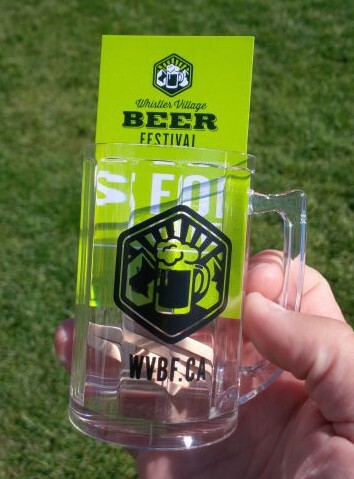 On Saturday September 13th, 2014 the Second Annual Whistler Village Beer Festival was held. The festival was held at the Whistler Olympic Park in the Whistler Village. The event started for average attendees at 1pm (opened at 12 for gatecrashers) and ran until 5pm (last call at 4:45). The event cost $35 or $45 for gatecrashers and included a branded 4oz mug, 5 beer tokens and a $5 off-site food voucher. extra tokens cost $1.5 with a maximum of 10 tokens purchased at a time. The second annual Whistler Village Beer Festival seemed to be a big success with over 3500 attendees. People from the biggest craft beer aficionados to people that like Macro beer but wanted to try something new were in attendance. Having this festival in the middle of this mountain paradise made for one of the looking craft beer festivals that I have ever attended. This festival may be smaller than the Victoria event but I would say that it is giving it a run for its money! Like all craft beer festivals the people at the festival were very friendly and loved to chat! I had all kinds of great conversations while walking around and taking photos. I had even better encounters when I was at breweries tents. Here are some of my more candid photos taken with my phone. If I could only pick one Beer Festival per year I would have to say that it would be hard not to pick this event! Between the amazing selection of breweries almost all being craft beer to the great food and the event better location nestled in the mountain resort town of Whistler. I would not hesitate to recommend this festival to any craft beer fan or anyone that is interested in expanding their palate. With all of the extra events that happen around this festival I would recommend coming up on the Thursday and staying until Sunday. It may be a pricy weekend but you will not regret it! Fool sized photos can be seen here. This entry was posted in Tasting Event and tagged Alexander Keith's Hop Series, Ankerbrau, bc, beer, beer festival, Beverage Concepts Int'l Network Agency, big rock brewery, big surf beer co, bomber brewing, bowen island brewing, Bravo Beer Corp, Brewhouse Whislter, british columbia, brooklyn brewery, Brouwerij Vansteenberge, canada, Canuck Empire, Cariboo, central city brewers & distillers, Copper & Theory, craft beer, craft beer festival, Creemore Springs Brewery, dead frog brewery, deep cove brewers & distillers, Deschutes Brewery, double mountain, driftwood brewery, fernie brewing, festival, four winds brewing, gigantic brewing, Glutenberg, granville island brewing, Grolsch, Howe Sound Brewing, hoyne brewing, Hub, Konig Ludwig Weissbier, lagunitas brewing, Lakefront Brewery, lighthouse brewing, Lost Coast Brewery, LTM, Mad & Noisy Brewing, magic hat, mission springs brewing, mt begbie brewing, ninkasi brewing, Okanagan Springs, old yale brewing, oskar blues brewery, parallel 49 brewing, Peroni, phillips brewing, Pilsner Urquell, postmark brewing, powell street craft brewery, prohibition brewing, Pyramid Breweries, Red Racer, red truck beer, russell brewing, samuel adams, scandal brewing, Scuttlebutt Brewing, shock top, sierra nevada, stanley park, steam whistle, steamworks brewing, trucraft beverages, Unibroue, untapped, vancouver island brewery, Watsteiner, Whistler, Whistler Brewing Co, whistler village, whistler village beer festival, worthy brewing.